Hirst’s Spire (Sanctum), 2009, is a unique print from the YBA artist’s Butterfly studies. 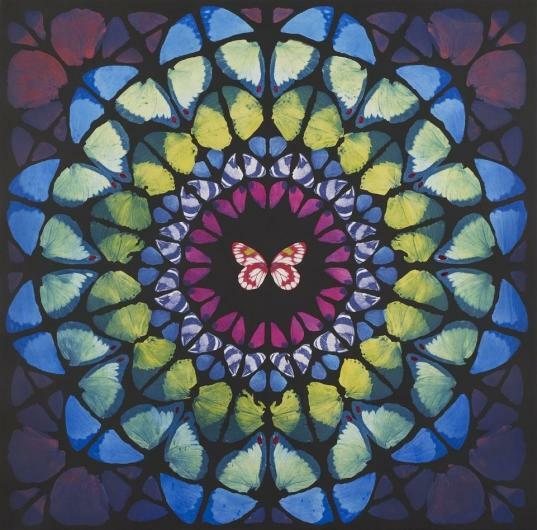 With its kaleidoscopic form, this work alludes to stained glass windows and their connection to religious spaces such as churches. The butterfly’s aesthetic beauty, as well as its ephemerality, make Sanctum a Gothic piece, because of its subject matter. A highly desirable artwork, similar pieces can be found in private collections such as that of Daphne Guinness. In his 2012 show at the Tate Modern, one of Hirst’s most controversial pieces was the butterfly room, which has strong links to the Sanctum series.